Heaven Knows I’m Miserable Now | No Chic. Just Geek. I don’t know, you wait years for a big-budget skiffy extravaganza concerning the fate of an abandoned and devastated planet Earth, and then two come along in the space of three months: closely in the wake of Oblivion, here comes After Earth, another film from M Night Shyamalan. Yes, despite his arguably not having made a decent film in well over ten years, people keep giving him multimillion dollar budgets to play with. Shyamalan’s track record of critical calamity seems likely to continue, with professional film-watchers hailing After Earth as ‘dreary’ and ‘terrible’; even Buzz Aldrin didn’t like it very much. Which means that, excitingly, it’s time for a rare instalment of Is It Really As Bad As All That? which deals with a film which is still in cinemas. And, well, I don’t want to cut to the chase too early, readers, but it very nearly is. I bobbed along to the sweetshop to pick up my ticket, found myself a bit distracted when I reached the front of the queue, and ended up asking for a ticket to see afterbirth rather than After Earth. They worked out what I was on about, obviously, but I have to say this may have been some sort of precognitive Freudian slip – spending 100 minutes chowing down on Jaden Smith’s placenta would probably have been a more memorable and nourishing experience than watching After Earth. Oh, boy. As is practically standard for a big-budget studio SF movie, this one kicks off with a scene-setting prologue with accompanying voice-over, and as I watched it my nasal passages were flooded with that special Bad Movie reek more strongly and quickly than I can ever recall happening before. There is a special combination of contrivance, cliche, and full-on exposition in the story of how the human race abandons the planet Earth, gets into a ruck with aliens on its adopted home planet, learns to fight various gribbly horrors, etc etc, that gets the movie off to a flying stop. 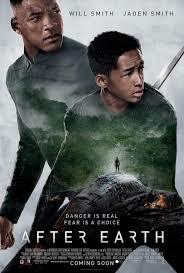 From here we meet various members of the Raige family, particularly teenaged boy Kitai (Jaden Smith) and his father Cypher (Will Smith) – why would you call someone a name like ‘Cypher’ in this sort of film, anyway? Surely it’s just asking for trouble? Hey ho. Smith Senior is humanity’s top soldier, mainly because he’s so very stern and grumpy all the time (stern and grumpy people are invisible to the alien monsters. No, don’t bother to think too hard about it). Smith Junior is academically gifted, but his quest to follow in his father’s footsteps is hampered by the fact that out in the field he is always dissolving into a meeping, glibbering idiot. There is awkward family history between Smiths Senior and Junior, their relationship is strained, not least by what an authoritarian parent he is… you’ve seen all this difficult-father-and-son-relationship before, I promise you, and done with more deftness and genuine emotion than it is here. Anyway, at the instigation of the lady of the family (Sophie Okonedo), Smith Senior takes Junior off on a space trip with him. The ship involved looks like a rather rickety contraption made of wicker and vellum and I was not at all surprised when it crashed en route (also there had been a flashforward to this). The ship goes down on the uninhabited planet Earth killing everyone on board but the Smiths, and a terrible ordeal begins (the characters don’t have a very nice time of it either). Unfortunately, the back end of the ship falls off on the way in, which is a problem because that’s where the distress signals are kept. Also – what are the chances? – the egg of a gribbly monster was also in the back end, and it may just have survived the crash and hatched. Sadly, Smith Senior has been a bit dinged up by the crash and so it falls to Smith Junior to toddle off across the wilderness to find the back end of the ship. One ill-timed meep or glibber could spell doom for the both of them, but luckily he has a radio so his father can pass on directions and important lessons in personal development along the way, rather like a cross between a life coach and a satnav. Meanwhile Smith Senior sits around in the wreckage, occasionally having personal flashbacks, recording unhelpful messages for his wife, performing gory DIY surgery on himself, and slowly sliding into a coma. Frankly, by the end of the film I was starting to feel the same way. Well, look: the storytelling is competently handled and the central message of the film is completely innocuous, but by any rational standard After Earth is, at best, a phenomenally boring film. I think Will Smith is a charismatic and engaging screen presence, and I thought Jaden Smith was perfectly fine in The Day The Earth Stood Still and The Karate Kid, and I can only wonder at what special technique it is that Shyamalan has employed to extract such grindingly dull performances from the pair of them. I suppose it is partly down to the script, and here at least Smith Senior must take some of the blame, seeing as he gets a story credit: where is the sense in doing a story about characters whose behaviour revolves around the fact they must never show any emotion? How are you supposed to care or get properly involved? This is before we even get to the background to the story or the details of the plot, both of which are perfunctory in the extreme. Don’t go looking for surprises, or unexpected reversals, or clever invention. Given this is a Shyamalan movie, I was almost expecting a quirky final twist: but there isn’t one. There are only the things you predicted were going to happen fifteen minutes into the film. As this is a studio movie made by professional film-makers with a respectable budget, the special effects are competently done and the look of the film is generally unexceptionable. But in virtually every other department After Earth clanks and squeaks and thuds its way through its running time, almost entirely thrill-free, joyless, pointless, actively irritating and deeply hackneyed (bits of it sort of resemble Outlander, but it’s not even that good). If there is a worse star-led major studio genre movie this year, I will be astonished.